There has been much written in recent years about the value of using nudges and behavioural economics when designing government policies, and in particular in designing regulations. It is mainly good stuff - and an introduction is below - but it is important to note that many of the insights are not at all new. Adam Smith himself noted that 'The chance of a gain is by every man more or less over-valued, and the chance of loss is by most men undervalued'. One aspect of this - the winner's curse - has also been recognised since antiquity. It is worth remembering, too, that the use of 'nudges' can be controversial. Nudges are somewhat paternalistic - and intentionally hard to spot. This can be problematic if they are used as an indirect means of doing what coercion does directly, which is to cause their targets to act in a way that they would not act of their own free will. It is also hard to evaluate the effectiveness of behavioural economics in a rigorous or scientific way. The cartoon at the end of this web page exemplifies the problem rather neatly. The Winner's Curse - mentioned above - is the well known phenomenon that those who win auctions, or set up new businesses are generally more optimistic and/or less well-informed than their competitors. They are therefore more likely to have over-estimated the chances of success or to have paid over the odds for winning a telecoms licence, an auction etc. Herding is very common. Managers and shareholders tend to worry much more than they should about sales and profits relative to competitors. They thus ignore the signals that they may be receiving from the market, including changing customer preferences and reducing costs (see for instance tacit coordination in the energy market). One very obvious example of herding is in senior executive remuneration, where no remuneration committee will ever accept that their managers are 'below average' and so constantly increase compensation packages, chasing averages that they are by definition bidding up. This is sometimes known as the Lake Wobegon effect after the famous town where all the children are above average. The problem with herding is that it often makes sense. The herd may often have a much greater collective knowledge than any one individual, so you can save yourself research and calculation costs by free-riding on the collective wisdom (you hope) of others. And anyone who has worked in any large organisation knows that it is so often better to fail with others than be adventurous and risk failing alone. This fact of corporate life is closely related to the MacWhirr Syndrome, personified by Joseph Conrad's Captain MacWhirr who did clearly recognise the signs of a devastating oncoming storm but also recognised that his employers would criticise him for delaying their cargo if he sought to sail round it. "Suppose", he says, "I went swinging off my course and came in two days late, and they asked me 'where have you been?' 'Went round to dodge the bad weather,' I would say. 'It must have been dam' bad, they would say. 'Don't know,' I would have to say, 'I've dodged clear of it.'" 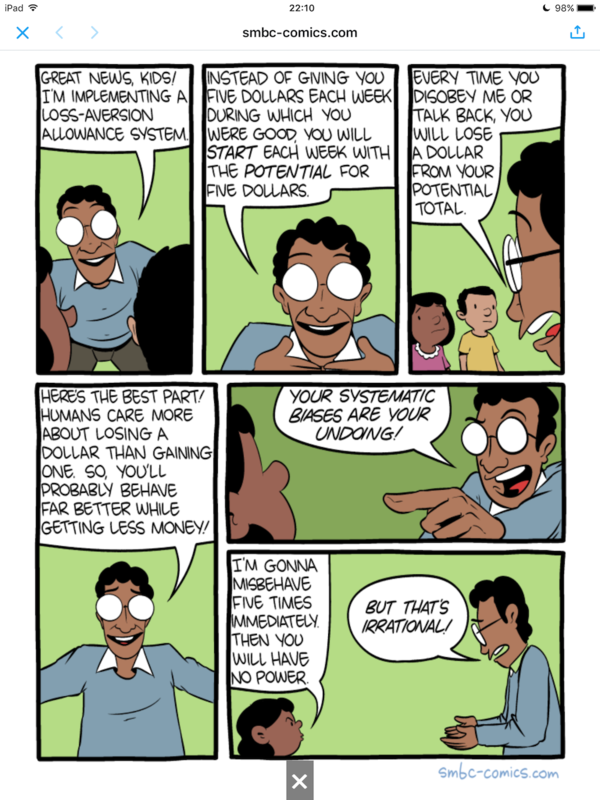 Loss aversion is also well known. We are all much more unhappy when we lose something than when we gain an equally valuable something. And willingness to pay to buy something is typically much lower than willingness to accept to sell something. This is a big problem in the case of compulsory purchase of land for new infrastructure. And communities will often spend a fortune to save the life or health of a named individual, whilst being decidedly unwilling to spend money collectively to buy, say, improved health care. Some behavioural economists like to claim that they are revolutionising competition policy, but they are in fact repeating what has been obvious to their colleagues since economics was invented. As well as the examples noted above, it is very clear that many consumers do not act solely so as to maximise their own narrowly defined economic self-interest. They often care about fairness, and can be altruistic. They sometimes buy less of certain goods (such as perfumes) if they appear too 'cheap'. To an outside observer, they may seem 'irrational' when they buy cigarettes, or when they worry about their income relative to their peers, rather than the adequacy of their absolute income. Their real world choices also depend on the way in which options are presented to them, and they vary greatly in the way in which they value the short term over the long term, and their response to various risks, including financial risks. All these truths do not invalidate the economic methods used by competition authorities, which are firmly based on real world theories of harm and observations of real, not idealised, consumer behaviour. Competition authorities accordingly deal with how consumers really behave, not as some theory says they should behave. They spend a lot of time, for instance, finding out how prices for different products are linked. If they were to find - for example - that demand for red cars did not change when demand for blue cars fell then that would be a bit surprising, but it would be accepted. They would not seek to argue that the two products should be substitutes just because rational consumers should not care that much about the colour. It is certainly true that competition authorities will generally assume that firms will act 'rationally' and will in particular seek to maximise profits. But this is (in the absence of strong evidence to the contrary) a perfectly plausible assumption, not least because of managers' fiduciary duty to prioritise the financial interests of shareholders. It is also a prudent assumption. It would hardly be sensible to approve a worrying merger simply because the owners of the newly merged entity declare that they do not intend to maximise its profits. And it should not be forgotten that altruistic owners may be succeeded by those with a stronger interest in profits. Competition authorities also recognise the dynamic nature of firms' interaction with each other and with their customers, and will if necessary apply techniques such as game theory. Equally, authorities will if necessary allow an anti-competitive merger if there are offsetting benefits to customers such as greater innovation or lower prices arising out of the behaviour or greater efficiency of the merged entity. FIPRA's Phil Evans delivered an entertaining speech about behavioural economics at the 2010 Vienna Competition Conference, and noted that "... [competition] authorities have, in the great tradition of all economics, adopted elements of behavioural economics without really realising that they were doing precisely that! In many ways we are all behavioural economists now! ... When we, as authorities and competition advocates, start to ask questions about how consumers behave, why they respond to certain stimuli in the way they do and how we can tailor our decisions and investigation processes best to reflect this learning we are forced to realise that our existing tools are inadequate. Bit by bit, and decision by decision we are adopting elements of behavioural economics almost by stealth. Indeed it is difficult now to read a credible competition assessment that does not recognise the complicated nature of consumer decision making and the need to ensure that remedies are able to reflect this complexity." The more evangelical behavioural economists claim that the work of other economists is too abstract and based on unrealistic assumptions, particularly about the 'rationality' of companies and consumers, the variation in firms' efficiency, the way they interact and so on. This may be true in the case of some academic research, but it is certainly not a fair criticism of modern competition authorities. Competition authorities do in particular recognise that information remedies need to be designed with real world consumers in mind - and that this is easier said than done. This is the area in which behavioural economics may one day prove very helpful, in helping us understand why consumers act as they do, rather than simply showing that they do not always act in their own economic self-interest. Finally, it is worth noting that even stock market bubbles and the like can be the result of rational behaviour. Herds usually run together for a good reason, and there is nothing irrational about humans seeking to watch and learn from what others are doing. Rational investors in an efficient market will therefore produce frenzies and crashes from time to time. See also my note on behavioural remedies. There is a summary here of an interesting paper on behavioural science and energy policy. ... "Proceed With Caution Raising general awareness of behavioral economics should be a good thing. It’s good to be aware of new insights into the intricacy of our behavior, and of the ways in which it can help solve problems and pursue opportunities.